In a medium saucepan, boil the potatoes in the stock until tender, about 15 minutes. Once the potatoes are cooked, use a masher or immersion blender to briefly smash them until they’re partly smooth and partly chunky. While the potatoes are boiling, saute the bacon in a large stockpot over medium-high heat until it starts to become crisp. Add the onions and carrots, lower the heat to medium, and cook, stirring, until the onions are translucent and the carrots are beginning to soften, about 10 minutes. Sprinkle the flour over the onions and carrots and cook, stirring, for 2-3 minutes. Gradually pour in the hot stock and cooked, smashed potatoes, stirring constantly to prevent lumps from forming. Add the milk and bring the soup to a simmer. Cook for 5 minutes, stirring occasionally, then add the broccoli and simmer for an additional 5 minutes. Stir in the cheese, sour cream, and seasonings. 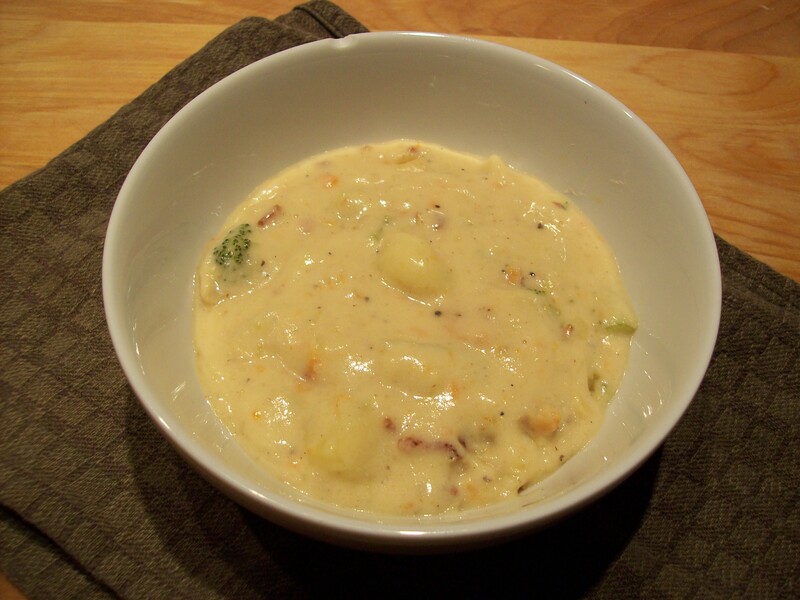 Cook the soup for another few minutes to melt the cheese and make sure it’s properly heated through. Taste, adjust seasonings as needed, and serve.